We were looking for a something called pine tar soap the other day to treat my son’s poison oak when we stumbled into Rivendale Bikes, Books and Hatches in Walnut Creek. The shop keeper Vince commented on my camera. When I mentioned that I mainly take moss plant photos he directed me outside to this patch of moss plants. I went outside expecting to be disappointed! On the contrary, there was a gigantic and robust patch of moss. If you go visit it for yourself, be sure to check out the steel framed bikes, meaningful books and the hand forged hatches inside! This shop rules quirkiness! If you love moss plant, forest and waterfalls photos, please look at my accounts on Instagram at @iheartmoss or Facebook at iheartmoss.com. We offer a nature-inspired jewelry shop on this site especially for nature lovers. An antler necklace, for example, helps you meet others who share your love of the outdoors. People wear sports jerseys, college, university, team, city gear as identifiers. Show your love for mother nature. It can help you meet others who share your interest and promotes hiking and time outdoors to others. My name is Karen Nierlich and I’m an artsy photographer in Northern California. Love sharing my moss plant photos with you. I’m not counting any raindrops yet, but the newspaper and meteorologist seem pretty confident we have a big storm arriving tonight and staying through the weekend. I’m keeping a day clear on my calendar so I can visit my mossy Bay Area haunts. Included here are photos I took after the rains in December 2014. The cuppy things are Pixie Cup Lichen. I’d never even seen this lichen before I started this project to photograph moss. One sees things that were unseen before one really starts to look intently! It a major axiom or life lesson. We determine what we see by how we look and what we look for! I’ve been hiking around all my life and never seen a pixie cup before this year! Let’s say it’s a perk of my moss project. While moss and lichen favor a lot of the same moist places, lichen is structurally very different. D-i-f-f-e-r-e-n-t is not understating it. Lichen may be the only symbiotic organism….Like moss and liverwort it’s a non-vascular plant, meaning it doesn’t have a system of cells that carry water, which it why it remains small and close to the ground. It gets water and minerals from its surface. Moss and Lichen is a collection of Moss images by photographer Karen Nierlich including the streets of Berkeley, Albany, Tilden, Muir Woods and the Dipsea Trail. Available from Lulu.com for $19.99. Click on book cover to access reviews and purchase! I’m feeling the loss of rain here in the Bay Area like many people. January is supposed to be the rainiest month of the year and we have had no rain! With the exception of a couple of cold days of strong wind, we’ve had warm, bright days. I miss our normal weather pattern with cold, wet days perfect for reading and making winter soups in the evenings and weekends. Those are my personal loses, but moreover, I worry for the plants and animals who are searching high and low for water and food to sustain them. In early December we had a week of stormy days. We were all a buzz exclaiming over it. My friends and I learned a new word, “Pluviophilia” which means love of rain. I knew I liked the rain, but now in it’s absence I know I love it. I don’t want a year of sunny days with no rain. I want some of each in approximately equal parts! Moss and Lichen is a collection of Moss images by photographer Karen Nierlich from around the Bay Area including the streets of Berkeley, Albany, Tilden, Muir Woods and the Dipsea Trail. Available from Lulu.com for $19.99. Click on book cover to access reviews and purchase! We found the mossiest trees I’ve ever seen while hiking the Dipsea Trail from Muir Woods to Stinson Beach! You can see them right here—the pose makes me think of rock album covers. You know the ones where the band members are all spaced out and looking cool. I was hopeful that this spot might be mossy all summer, but I’ve already been back and not so. A month later and there is nothing but drier and dry moss. A few weeks ago I wrote about Moss Rocks created by David Spain, a landscape architect in Raleigh, North Carolina. My business women mind is proud of David for creating a marvelous home decor “product” that is beautiful, easy to care for and makes a great gift. This is an artsy, natural object that is perfectly priced as a gift and can be sold for ongoing income. My artist self wants to show you the other things David makes. 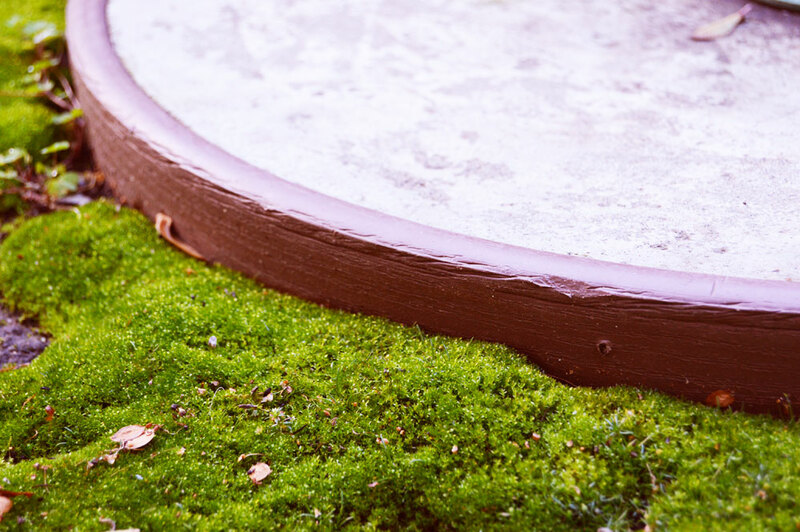 One-of-a-kind moss miniature dish gardens…similar to bonsai. The miniature moss dish gardens incorporate many elements in addition to moss such as lichen, wood, ceramic, glass bell jars, other plants. If you go to the moss and stone gardens website, you can see many photos of the moss dish gardens. There are also mossy landscapes to admire. The example in the photo here is planted in a found piece of maple. That’s a minature Japanese maple in the center surrounded by different mosses, lichen covered rock and a small # of ferns. Very delicate, landscape-like and restful to gaze on. I gave one of the moss rocks as a gift this holiday and received one as a gift as well. My sister-in-law gave several as gifts. I have one on my desk by my computer where I can look at it at any time and I’ll even admit to petting it. I woke up this morning thinking about how sometimes I like to include cars, sewers, chain link fences and other made things in my photos. I guess I think of it as true to the real status of nature as barely co-existing or at the mercy of our human encroachment. I took a series of pictures last year at Muir Woods last Spring. I found it kind of ironic and slightly humorous that I discovered a collection of dancing moss trees over a creek by the parking lot at Muir Wood. Though I hike and walk quite a lot, one of the mossiest sites I found was practically in a parking lot. Karen Nierlich is the author of www.iheartmoss.com a blog about moss and art, craft & decor. Heading out tomorrow at 6 am to the mountains near Tahoe to commune with my extended family and nature. I’ll have a camera in hand loaned to me by a friend, Francesco. I’m particularly grateful for the camera, as the one I had stopped working when I dropped it. Opps. You are invited to follow me on Twitter at https://twitter.com/#!/AlmostEvrything. Stayed Tuned for more photos from Muir Woods. The Moss Maiden and her Giant friend reside in the Lost Gardens of Heligan, near Mevagissey in Cornwall. The two sculptures were created by Artist Sue Hill and her brother Pete Hill. In the photos the giant looks alive…the shape of his eye sockets and eye balls are so compelling. His sculpted ear and nose are somewhat exaggerated and humorous and integrate so well with the plants of his hair and skin. The moss maiden I admire for the way she hugs the earth and becomes one with the forest around her. If you are wondering how the moss maiden was created…the project started with a hallow frame of timber and windbreak netting which was then covered with sticky mud. Mud, sand and cement were mixed together to form her face and hands and then coated with yogurt to encourage the growth of lichen. Her hair is Woodsedge and Montebretia plants while her clothes are ivy. The Giant’s head was created out of a fallen tree with a huge root ball. Again, mud was plastered onto the tree root to create the face. Finally twigs were scattered through and stuck on the top of the head. Sue and Pete Hill have created other moss maidens for The Eden Project in Cornwall and the 2006 Chelsea Flower show and other earthwork installations. Today Sue is a core member of Wildworks, an unconventional Cornish theatre group that travels the world to create massive installation/ theater events. The Lost Gardens of Heligan are an expansive Cornwall, England estate that fell into neglect during WWII. Today its a popular botanical garden. From the mid-18th Century to the beginning of the 20th Century, the Tremayne family created the gardens which are made of several gardens of different designs as was typical of 19th Century estates. Before WWI there were 22 gardeners caring for the gardens, 16 of whom died in the war. In the decades that followed the house was rented out. In the 1990’s the gardens were rediscovered and restored by a member of the extended family and other garden enthusiasts. The local economy was revitalized when the garden restoration project became the subject of a British TV series in 1996. You can see other mud/moss sculptures at this link including several moss maidens’ created by Sue and Pete Hill. Learn more about the Lost Gardens of Heligan on Wikipedia. Short Bio of Sue Hill at The Wildworks. Giving credit where credit due. As best I can tell these Moss Maiden and Giant photos are by: Ollie O’Brien, Fat Dad, Walt Jabsco (larger Giant image), and Liz Jones (maiden). 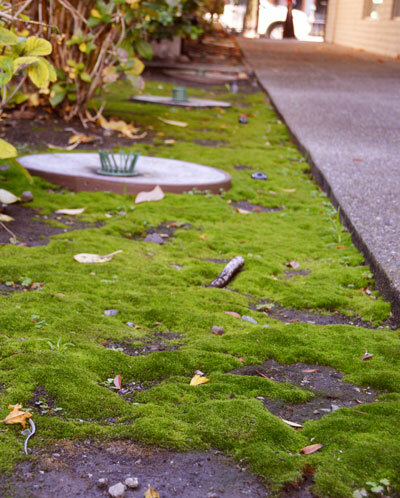 This image is the most popular of the Moss in the City photos. You are seeing a small metal cover 5-6 inches across on a driveway on Masonic at Brighton in Albany, CA. This photo reminds me of the abstract paintings of Catalan artist Antoni Tàpies. I lived in Barcelona, Spain when I was 20 (1985) and Tàpies’s work was very popular. He creates elegant, enthralling compositions inspired by graffiti and the city. I think these moss rocks are more elegant than cute, but its their cuteness that makes me want one on my desk. Leave aside the fact that I’m totally bias with anything to do with moss, these are among the loveliest objects I have ever seen. What do I love? The bright colors, smooth surface, off center orientation, old / new quality of the glaze…the shine says new and the crackling says old. Last but not least the soft, green moss gracing the top. Now you all know what to get me for Christmas but on the other hand all my crafty family members will know what they’ll receive. 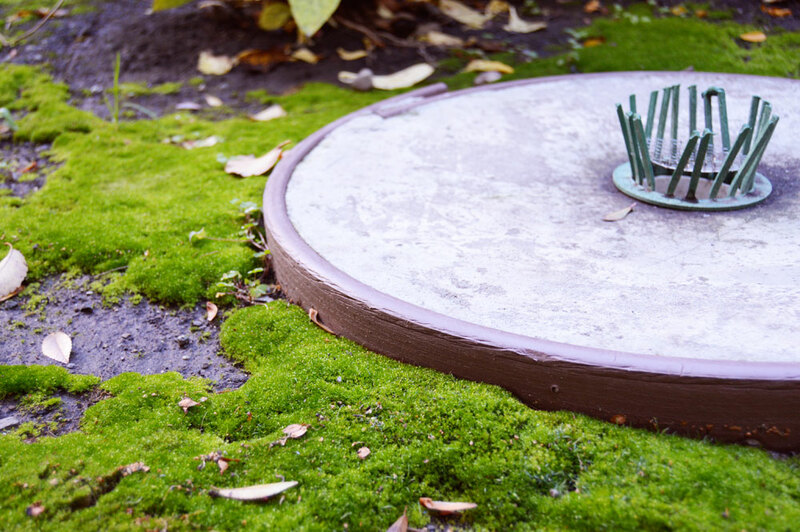 Designed by David Spain, co-owner of Moss and Stone Gardens – “Where Moss Rocks!” Just in case you want one of these for your own, they are sold with the moss pre-planted, can be safely shipped with no harm to the Dicranum moss plant. Can be placed indoors or out and requires little maintenance. The Moss Rocks online store opened yesterday. You can be among the first to purchase and you are supporting a unique product from a small business.